Within walking distance of several restaurants and offering premium cable on large-screen TVs La Quinta Inn & Suites Elizabethtown is just the ticket for our guests. This 62-room non-smoking La Quinta Inn & Suites on three floors offers free Wi-Fi and wired high-speed internet access microwaves and refrigerators 42-inch flat-panel TVs and comfortable beds in all rooms. La Quinta provides a free newspaper and a free continental breakfast every morning. The business center has your back and when you get some free time the indoor heated pool hot tub and fitness center will keep you in shape and relaxed after a busy day. There's also an on-site laundry facility for guests which can be a lifesaver when you're on the road. Parking is free and pets are welcome with some restrictions so there's no need to leave your best friend behind. 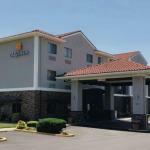 La Quinta Inn & Suites is off of I-65 less than three miles from the historic district in the center of Elizabethtown. Churchill Downs and downtown Louisville are 45 minutes away. Fort Knox is a 30-minute drive from the hotel. When it's time to take off Louisville International Airport is 39 miles north. Dogs up to 30 pounds are allowed. There are no additional pet fees. Dogs must be quiet, leashed, and cleaned up after. There are only 4 pet friendly rooms at this hotel, and two of them are non-smoking rooms. There is a $50 refundable deposit if the room is being paid with cash instead of a credit card, otherwise there is no deposit.